Welcome to Concept Chalets, we offer you a new brand of style and luxury in the mountain resort of Borovets, Bulgaria. Concept Chalets was setup to bring you a new level of luxury accommodation in Borovets. We have created a special place where you can experience the splendour of the Rila mountains both in winter and summer. Are you tired of boring soulless Borovets hotels? Do you want to enjoy the comfort of a private apartment or chalet yet have all the services of a luxury boutique hotel in Borovets? Then come and join us at Chamkoria Chalets & Apartments. For us it is all about creating the ideal holiday experience in the heart of Bulgaria's most impressive mountain range. At Concept Chalets the holiday experience begins long before you arrive in Borovets. We provide a full range of services from airport transfers and ski hire to mountain guides and walking tours. We can work with you to design the ideal mountain experience before you arrive for your holiday in Bulgaria. Choose from any of our winter or summer activities and get the most out of your time in the Rila mountains. Whether you prefer a 4-bedroom luxury chalet or just a cosy studio we promise you a real mountain experience. Our chalets and apartments are located in a small private hamlet on the edge of Borovets and offer the only boutique accommodation in Borovets. Our private and discrete self catering accommodation allows you to experience the raw magic of the Rila mountains and at the same time be pampered with all the services of a boutique Borovets hotel. After a day on the mountain you desire to treat yourself. Why not enjoy a meal in our bistro, sip a vin chaud by the fireside or simply relax in the spa. Accommodates: 10 people in 4 bedrooms. Relax in the comfort of a luxury chalet. Ideal for your ski holiday in Bulgaria. Check out our selection of luxury Bulgaria ski apartments in Borovets. Just minutes from the ski pistes with full spa and leisure facilities on site. 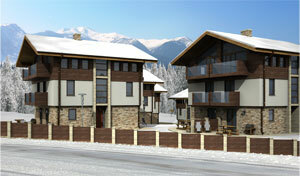 Our Borovets apartments range in size from studios to 3 bedroom maisonettes. Chamkoria Chalets has a beautiful spa with indoor swimming pool, sauna, Jacuzzi, massage & hydro-therapy. You can relax in the pool or Jacuzzi or enjoy an invigorating spa treatment after a hard day on the slopes. We offer full ski and snowboard hire in Borovets. Book your Borovets ski pass in advance and save money!!! Ski school or private ski lessons we can arrange it all before you arrive in Borovets. Book now for the best prices.